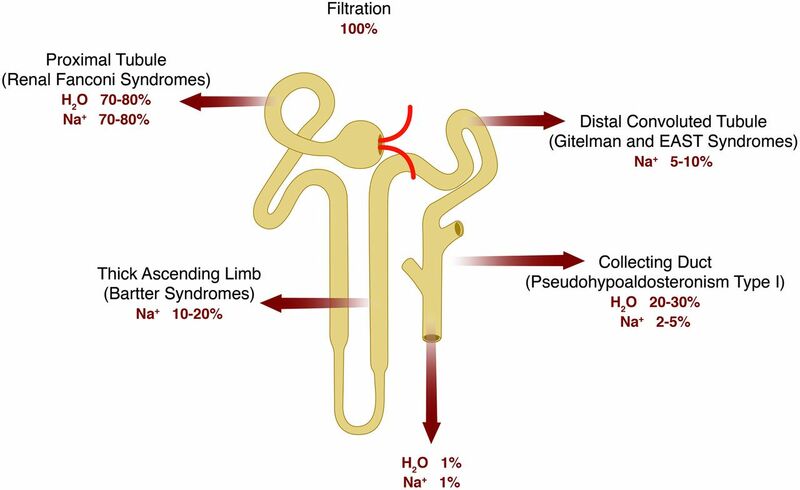 Sodium and water reabsorption along the nephron. Knockouts of distinctive proteins in particular nephron segments lead to distinctive disease in man, as indicated. Simplified diagram of a PT cell. Sodium reabsorption in the PT is mainly accomplished by NHE3, which exchanges sodium for protons. Other sodium-coupled transporters use the chemical and electrical gradient of sodium for the reabsorption of molecules (X stands for, e.g., glucose, amino acids, phosphate). Simplified diagram of a TAL cell. Sodium is reabsorbed electroneutrally via NKCC2 (defective in Bartter type 1), together with one potassium and two chloride ions. The transporter can only function with all four ions bound and, because of its luminal concentration, potassium binding becomes the rate-limiting step. Therefore, potassium is recycled through the potassium channel ROMK1 (defective in Bartter type 2) to ensure an adequate luminal supply of potassium. This also generates a lumen positive transepithelial potential, providing the driving force for paracellular absorption of calcium and magnesium. 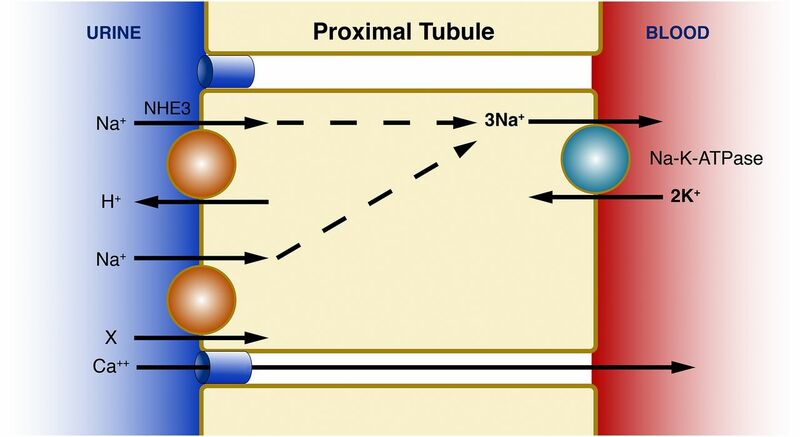 Sodium exits the cell on the basolateral (blood side) via the Na-K-ATPase, whereas chloride exits through the chloride channels CLCNKB (defective in Bartter type 3) and CLCNKA; both require Barttin (defective in Bartter type 4) for proper membrane localization. NKCC2 can be inhibited by loop diuretics, such as furosemide. Simplified diagram of a DCT cell. Sodium is reabsorbed electroneutrally via a sodium-chloride cotransporter (NCC) and can then exit toward the blood side via the Na-K-ATPase, whereas chloride can pass through the basolateral chloride channel CLCKNB. KCNJ10 indirectly regulates Na-K-ATPase activity by providing a supply of potassium dependent on basolateral potassium concentration. NCC can be inhibited by thiazides. Impaired salt reabsorption in DCT indirectly affects magnesium uptake via TRPM6, explaining the renal magnesium wasting for salt-losing disorders of the DCT. 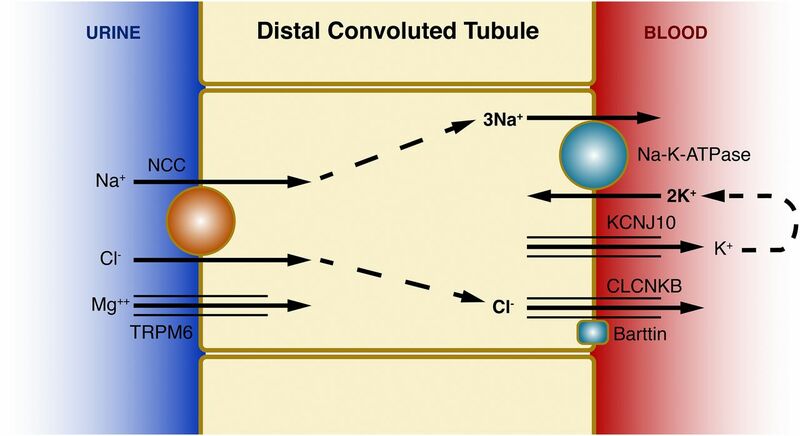 Simplified diagram of a principal cell and type 1 intercalated cell in the cortical CD. Sodium reabsorption occurs electrogenically through ENaC and Na-K-ATPase and thus facilitates potassium and proton secretion through ROMK and the H+-ATPase, respectively. Aldosterone indirectly affects the activity of these proteins via the mineralocorticoid receptor MRCR. ENaC can be inhibited by amiloride. Listed are inherited salt-wasting disorders, including the underlying gene/protein and clinical characteristics. Note that most of these clinical disorders can have a wide spectrum of severity. Typical clinical findings listed thus reflect symptoms seen in most, but not necessarily all, patients. Data from OMIM, HUGO, and NCBI (build 35.1). ?, unknown; AD, autosomal dominant; AR, autosomal recessive. ↵a Recessive mutations in SLC34A1 have also been reported as a cause of FRTS2 (OMIM 613388, see text). ↵b These forms of BS also affect salt reabsorption in the distal tubule. PT Do antiproteinuric drugs such as ACEi protect kidney function, if proteinuria is of tubular origin? TAL Is salt supplementation beneficial in patients with secondary NDI? Which COXi provides best efficacy with least side effects: indomethacin, ibuprofen, or celexocib? Should COXi be weaned off during school age or should they be maintained life-long? Is antenatal treatment of BS beneficial? TAL and DCT What is the best classification for BS and GS? What is the lower limit of plasma potassium concentration that can be considered safe? Are antiproteinuric drugs indicated in patients who have developed proteinuria? What is the lower limit of plasma magnesium concentration that can be considered safe? DCT Is salt supplementation alone sufficient to normalize renin and aldosterone levels? Listed are clinical controversies discussed in this review. These controversies need clarification through clinical trials and/or expert consensus. ACEi, angiotensin-converting enzyme inhibitors, COXi, cyclooxygenase inhibitors.